cable) Great for green lasers mounted on telescopes in cold conditions. from our #DNCP cigarette lighter cable sold below. Draws about 0.085 amps at 12 volts so battery life is barely effected. Supplied pre-formed to wrap around the laser, not flat as pictured. The thin power cable snakes inside laser mounts without interference. conditions, but our heater can keep them going when it's really chilly. Shown attached to our #LAS5 GLP and mounted in our #SFM1 mount. Laser and mount sold separately! $19.00 - #DNCP - Fused Cigarette Lighter Plug Adapter for Dew-Not Dew Removers, 6 ft long. $11.00 - #DNX4 - Dew Heater Extension Cable - 4 Feet Long, RCA-F to RCA-M - Information is Here! $12.00 - #DNX8 - Dew Heater Extension Cable - 8 Feet Long, RCA-F to RCA-M - Information is Here! $34.00 - #PS13 - Power Supply for Dew Heaters, 120VAC input, 12.5VDC output - Information is Here! 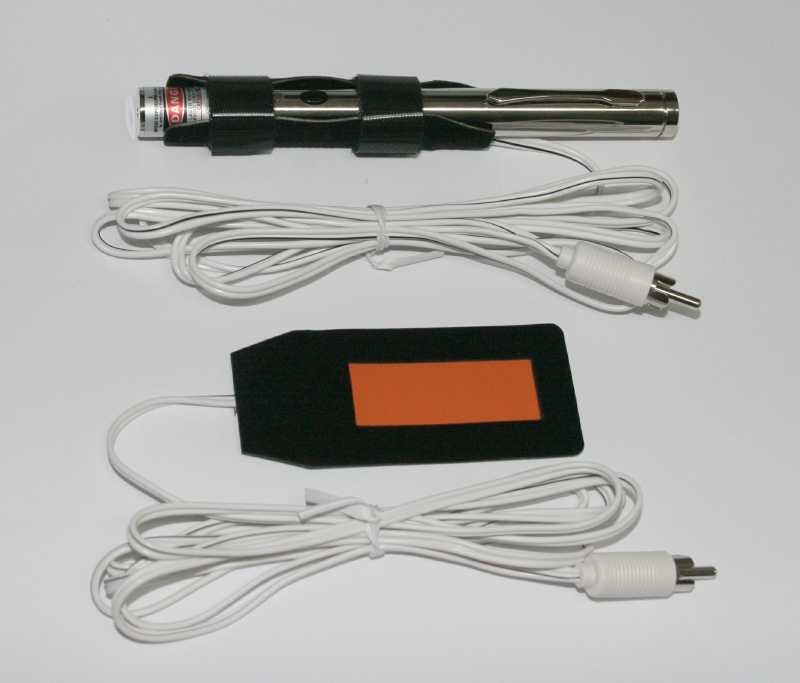 Green Laser Pointer - 4-5mw output power!